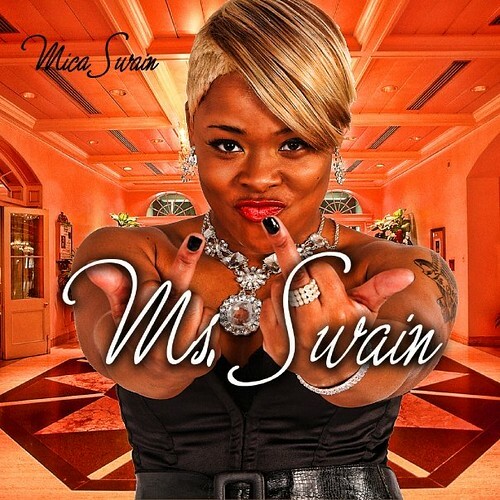 Today in Carolina Hip Hop History, Mica Swain released Ms. Swain on March 2, 2009. Mica Swain released Ms. Swain on the 2nd day of Women’s History Month (March). The album was her second project and came out on her self-owned record label, Backwoodz Muzic Inc. Mica Swain hails from Plymonth, NC. Ms. Swain was a true album with original music. This was no ordinary mixtape with rhymes over popular industry beats! Five of the thirteen tracks had also appeared on Mica Swain’s first album Product Of Da NC. Her first mixtape was also titled Product Of Da NC but it is not to be confused with the album, as the mixtape included totally different music. At the time Mica Swain released Ms. Swain, there were not many other female rappers from North Carolina. Shelly B, Rapsody and Lil Buna were the names most people tuned into Carolina hip hop knew about. One thing that set Mica Swain apart from the rest is that she sang in addition to rapping. A good amount of the production on Ms. Swain was handled by DJ Barry Bee and Manifest. By 2009, DJ Barry Bee had established himself as one of the more known DJ’s in NC. Physical copies of his mixtapes could be found all over the state. DJ Barry Bee produced “Dope Boy Magic“, one of the biggest hits off of Ms. Swain. The album also included a feature from Rico Barrino, “She Got It”. Other jammin’ tracks off Ms. Swain were “Gimme Dat Ducee” and “Mulah”. One additional notable is “Your Property”, which featured Jamla Records’ Heather Victoria. As 2009 went on, Mica Swain continued to make a name for herself throughout the South. By the end of the year, Mica Swain landed in the studio with Waka Flocka Flame. The two came together and created one of her biggest hits to date, “Body Talk“. Mica Swain’s most recent work is “The Back Side“, which came out in January 2014. The track was to appear on her album Swain’s World, which has not been released to date. This entry was posted in Album, Music and tagged Backwoodz Muzik Inc., Mica Swain. Bookmark the permalink.